« There’s Nothing Wrong with OpenGL’s Specular Lighting! 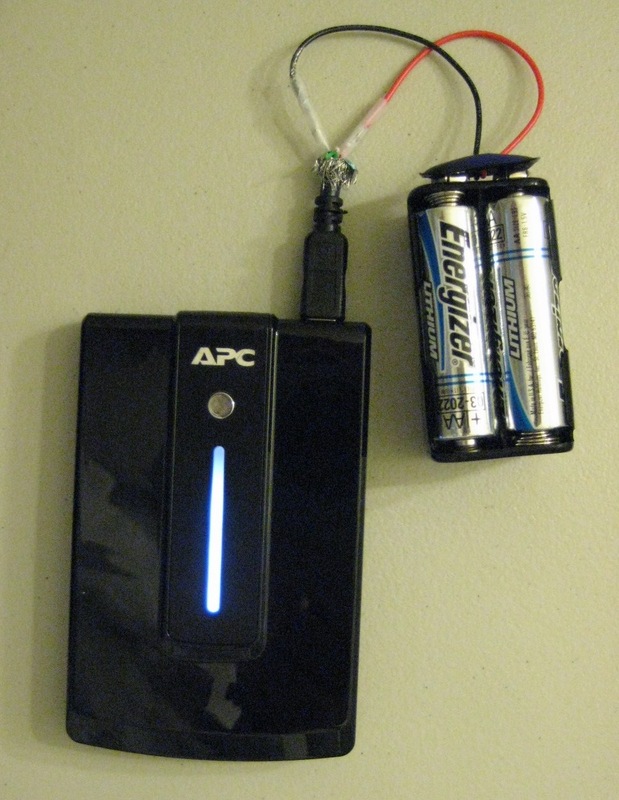 How to Charge Any USB Device with AA Batteries – Make Your Own Battery Pack!!! And since it takes four 1.5V “AA” batteries outputting six volts total instead of the standard 5V from the phone’s AC adapter, this homemade battery pack charges the phone faster! Four lithium ion AA batteries (Nickel Metal Hydride’s [NiMH] should work good too). Battery holder connector plug (looks exactly like a 9V battery connector). Any cable with a female “4 Pin Mini-USB” or “5 Pin Mini-USB” connector on one end. Solder and soldering-iron (not shown). The battery holder needs to carry four “AA” size batteries. Make sure you get a USB cable that you don’t care about because you’ll be destroying it. The wire strippers must do really small gauges (24 – 26 AWG). I would highly recommend using the thickest USB cable you can find or else the internal wires might be too small to strip. Cut the USB cable in half starting from at least one-inch underneath the mini-USB connector’s head. You’ll be working with the side that the mini-connector is attached; discard the other half. Strip off some of the black outer insulation exposing the shielding and wires inside. Cut off the outer shielding, or bend it away making the inner wires easy to access. Now you should see a few little wires each with a different color – strip the red and black wires only (the others aren’t needed). Take the red wire you just stripped and solder it to the battery connector plug’s red wire. Take the black wire you just stripped and solder it to the battery connector plug’s black wire. Wrap some insulation around the exposed metal to prevent a short. IMPORTANT: IF YOU DON’T PUT INSULATION AROUND THE EXPOSED METAL AND THEY MAKE CONTACT, YOU’LL SHORT-CIRCUIT THE BATTERIES!! THIS CAN CAUSE THEM TO EXPLODE AND KILL YOU!!! 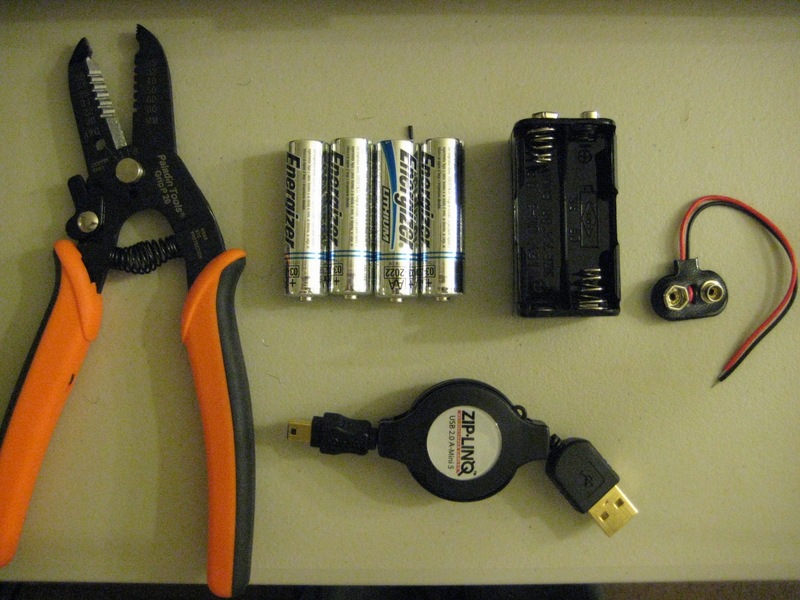 Take the four “AA” batteries and insert them into the battery holder. Plug the 9V connector to the battery holder. Not only did my battery pack work on my phone, I also tried it on an “APC USB Backup Battery Pack” (funny – the commercial version of my contraption) and sure enough, the APC pack started charging! OK, I know this is totally redundant, but it’s the only other device I have which takes a mini-USB connector. I need to get a converter cable and try it on my iPod! That’ll be for a future post. Speaking of future posts, the whole idea of this circuit being 6V instead of 5V makes me a little nervous. 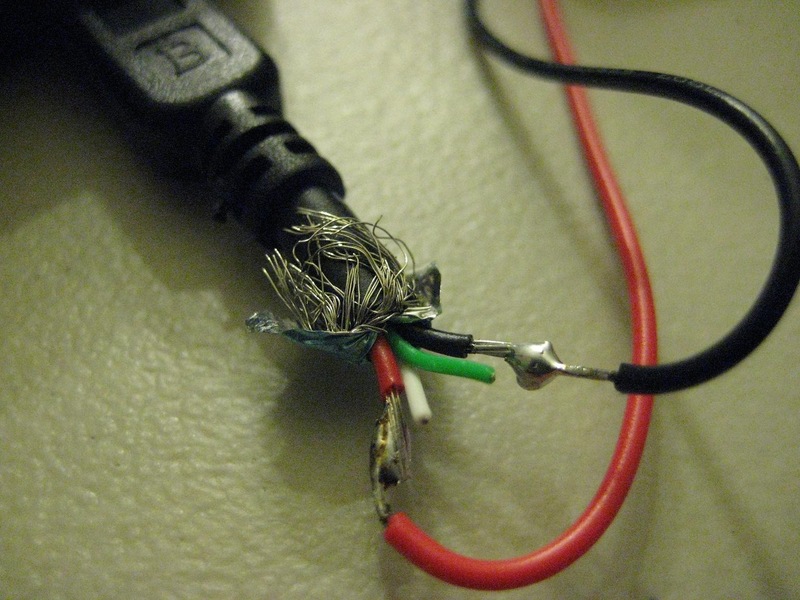 For USB devices, it really should be 5V max. For my next post on this subject I’ll slap two resistors across the battery input leads to make a voltage divider and force a 5V output. As always, you can get automatic updates whenever I post new articles via the RSS feed (subscribe here), or if you prefer email updates, click here. This entry was posted on December 23, 2007 at 8:57 am	and is filed under Cool Stuff. You can follow any responses to this entry through the RSS 2.0 feed. You can leave a response, or trackback from your own site. I applaud your experimentation with useful solutions for common problems. However, you should be VERY nervous about using 6V instead of 5V for your device. USB output port voltage is between 4.75 V and 5.25 V, (http://www.hardwarebook.info/Universal_Serial_Bus_(USB))which is the design voltage for a USB plug-in device. Using voltages outside of this range can cause damage to your device. Units are designed to charge SAFELY at the specified voltage. Faster is not better since you risk damage. A better solution than resisitors for voltage drop would be inserting one or two diodes. They give you a constant voltage drop (you should measure this). Another considertion: If you use four NiMH or NICAD batteries you will have 4.8 volts nominal on the pack. A much safer way to go. Thanks for the voltage specs and other suggestions! 🙂 When you say use diodes because they give you a constant voltage drop, do you mean the drop across the load will be constant even if the load’s resistance varies? That’s one problem I face with the typical two-resistor voltage divider circuit – the load resistor may be at a constant voltage when no load is connected across it, but as soon as something is connected the voltage decreases depending on load-resistance. Obviously this is no good if I’m going to be charging more than one device as each device will have different resistances. I’ve already tried NiMH batteries, and they worked. However, even though I was using one’s rated at 2500 mAh capacity (my phone’s battery is 1350 mAh), the phone only charged one time to 92% and a second time to about 25% before the AA’s needed recharging; I’d think that it should charge to 100% almost two times (2500 / 1350). Do you know why this is? Assuming that the battery outputs the rated mAh you are purely experiencing the innefficiency in the charging process. What about this scenario (this might be a stupid question, but remember my EE experience is very limited): if I connected another battery pack in _parallel_, not series, does this double my mAh rating? Sorry I did not respond sooner–I don’t regularly check this forum. For what you are doing, I think a 1N4001 is good–it can handle 1 amp. If your circuit will charge more than that, get a bigger diode. Radio Shack sells these. No, you cannot use an light emitting diode (LED) to do this, because it will burn out at 30 to 40 ma. There are some good books that Radio Shack used to sell on learning basic electronics. Yes two parallel connected battery packs will increases the charge capacity, but you may (or may not) have an imbalance problem between the two charge source batteries if they are not the same type, capacity, age, and charge level. If you have two packs for charging, why not just use one after the other? Another option is to make a charge pack with 5000 ma cells. Another factor is that the charge and discharge curves are not straight. When you start charging, the source voltage is high and the depleted cells’ voltage is low. As time passes, the the source voltage decreases and the voltage of the cells being charged increases. At some point they are equal (including the drops across other circuit components) and the charging stops even though the source cells are not fully depleted. “Discharged” voltage (under load) may be somewhere around 1 volt per cell. This is a typical cut-off voltage for discharging and it is not good to discharge NiMH cells less than that. Fully charged voltage while the charging source is active is about 1.4 to 1.46 volts. Why don’t I use one after the other? Convenience really; I have two NiMH chargers that combined can charge eight AA batteries at one time. So I only need to worry about charging ’em all at once every few days. 5000 mA cells? They actually make those in AA size??? No, not 5000 ma in AA size. The bigger capacity cells are physically larger…at this time anyway. I have some 5000 AH NiMH cells they look something like C size cells. Go search online, there are a lot of sources. You had a simple and good idea. I will use it myself but it’s not very efficient. The reason is that when you connect a battery pack to the device via the USB you are connecting both batteries directly to each other. So the 2500mAh battery pack will start to loose capacity and the charged battery will start to gain capacity. The charging process will stop as soon as one of two things happen: 1)The charged device gets a full load; 2) The two batteries get a equal load (and this is what happend to you). When the battery pack lost half it’s capacity (1250mAh) the charged device had that same charge. So it couldnt charge more than that. If you do the math you can see that 1250mAh is actually 92% of the 1350mAh so you got the best charge possible for the given conditions.To get a 100% charge you have to get a 1350×2=2700mAh pack. This is why you need to add some electronics to get more “juice” out of the battery pack in to the device. And Ralph gave a good idea to use rechargeble batteries rated 1.2V to get 4.8V. Over voltage with 4×1.5V is a good way to kill your battery a lot faster. Thanks for the info, it makes sense. I’ve also switched to 1.2Vx4 and it’s been working fine for a while now. I wonder what if I use a RC Car recharge pack connected to a USB port? THe pack is rated at 4.6 Volts so will it charge the phone? Wont the power in the USB device discharge into the pack? 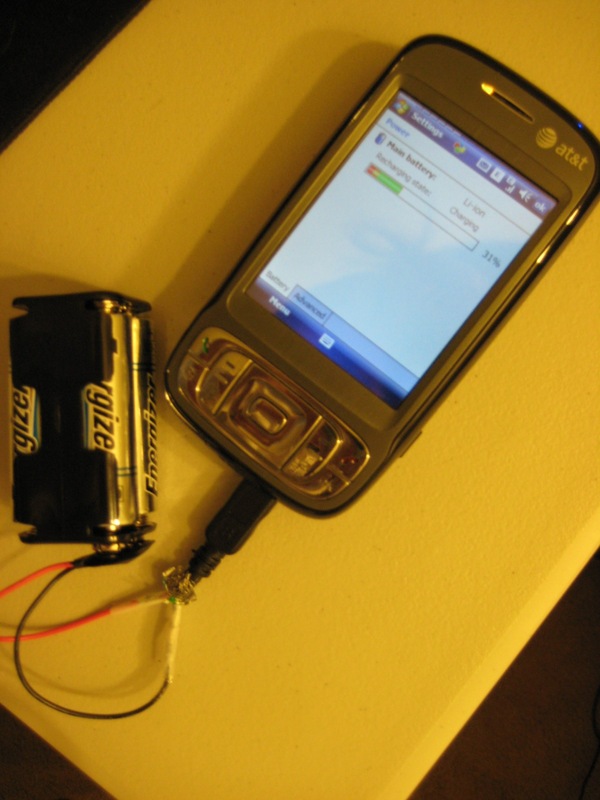 I want to use this idea to charge my Motorola V3i but the Motorola’s battery rating is 3.6 volts, and im scared if the RC pack damages my phone. Or what If I take apart my Phone charger, and connect the RC battery pack to it? Will it charge my phone or will it destroy my phone? If your phone is capable of charging through a USB port, then you can safely assume 5V to the phone is good. That’s around what most USB ports deliver. Hardware USB specification says voltage output should be between 4.75V and 5.25V. I read somewhere that in order to charge most rechargable batteries, the voltage source needs to be about 1.47V higher than the battery being charged. I’m not sure if this source was reliable, but I’ve found it to be true with my phone. My phone has a 3.7V battery, and I’ve used a charging source as high as 6V with no harm, but that’s a little risky. I now use a 5.48V source (four NiMH 1.2V cells – I don’t know why, but all NiMH batteries fully charged register at 1.37V on my volt meter, not 1.2V like the package says). Once my source goes below about 5V, the phone stops charging. I think your 4.6V source might be too low to charge your phone. But then again, I don’t know the electronics in your phone, it may have a voltage regulator. Try it and see. I highly doubt a pack that low will damage your phone especially since your computer’s USB port is definitely higher than 4.6V. And if your computer’s USB can charge the phone, then it makes sense. I would advise against taking apart your phone charger and connecting the RC pack to it. Unless you have a schematic of both circuits, you don’t know how it’s going to behave or what the final output voltage will be. Just a sample to understand why not possibile fully recharge a battery with an other one. Try to visualise an empty bucket and a filled one. Connect a pipe between the buckets to fill up the empty one. Can you fill it? What to need to complete this challange? You need a voltage different to get current. If no current, no charging. That is why you need biger capacity and/or biger voltage of charger battery. That makes sense. Thanks for the info! Great!. I went with 4xAA Ni-Cd (4.8V) with a usb cable female attached. I have a powerful 1W LED light with USB connection I power from this. So this is also a portable torch!.. When batteries are low I recharge from USB port of any PC or connect up to my 6V mini-solar panel. Now I want to add cellphone plug with USB male connection so that I can charge phone from PC USB or battery pack. Now just to find the plug to buy for Nokia e51 (2mm)???? Now what i am wondering is if you can have a custom battery pack built with the correct voltage and then mate the other side of your favorate connector to the USB and use it like that. I’m pondering, nice build btw i like it and will have to play with this idea. Hi. Ive read this thread and im thinking of using a 1N4001 to utilize the 0.7V drop over the 6V supply but that will still only bring the supply down to 5.3V and not the max 5.25V specification of a standard USB output. Is this a problem or am I just nit picking. What other options are there in the way of diodes to drop the supply to 5V? Which is what I measure when I test the supply from my computers USB port. Can I just use 2 diodes in series? I really don’t think an extra 0.05V is going to break a device, but some may disagree. Perhaps try hooking the device to an adjustable power supply and increment the voltage by .01V at a time. If the device starts acting weird, immediately lower the voltage, or cut the power. The max voltage I tried on my phone was 6V, and it worked fine (still works now), but some people have told me this is very dangerous. About the diodes – I believe, but I could be wrong, that hooking them in series has an additive effect – so, yes, the voltage will drop by the sum of the individual drops across both diodes. Funky — thanks for the tip! Who makes that chip? I’ll see if Fry’s has it. I was wondering if this project will work in a micro-USB plug becauce i have a science project and an enV2 so I was wondering if it will work on my phone. Russell – no, the micro-USB pinouts are slightly different and there are two types of micro-USB configurations – type A and B. For both types, pin 5 is ground (typically a black wire). Sometimes pin 4 is connected to ground and other times it’s not used. Pins 1 – 3 are the same as regular USB. See this page (near the bottom) for details on each pin and wire colors – http://www.accesscomms.com.au/reference/usb.htm. I referred to this guide while building a simple circuitless aa charger for my phone. only difference was I wired the battery holder to the female connector of a USB extension cable, not to the male side of a usb cable. since USB pinouts are standard, there is no confusion about the 5th micro USB pin. since it’s a USB female connector just like a USB port, any usb cable, mini micro or otherwise should plug in and charge. this was a quick job, next I might fix a usb port on the battery holder itself, so there won’t be 2 wire interfaces, just one. circuits will come later, first a simple 7805 based one to limit output to 5v and next a dc boost converter which should work as a joule thief and extract maximum juice from the battery pack while maintaining 5v.imple circuitless aa charger for my phone. only difference was I wired the battery holder to the female connector of a USB extension cable, not to the male side of a usb cable. since USB pinouts are standard, there is no confusion about the 5th micro USB pin. since it’s a USB female connector just like a USB port, any usb cable, mini micro or otherwise should plug in and charge. this was a quick job, next I might fix a usb port on the battery holder itself, so there won’t be 2 wire interfaces, just one. circuits will come later, first a simple 7805 based one to limit output to 5v and next a dc boost converter which should work as a joule thief and extract maximum juice from the battery pack while maintaining 5v. Funky – Your approach of using a higher voltage source battery and a 5volt regulator is the right way to go. Unfortunately the average 9v PP3 battery has a very low Ah rating and high cost making them a poor choice as a power source. The best and cheapest solution for this type of project is to use a pack of AA cells followed by a 7805 regulator. 6x AA alkaline batteries will give a source voltage of 9v which is enough headroom for a 7805 regulator to do it’s business. Alternatively a pack of 8x AA Ni-MH rechargeables will provide a nominal source voltage of 9.6v, again plenty to source a 7805 regulator. The 7805 regulator is dead easy to wire up too. For those unfamiliar with the device, it has three terminals designated INPUT, COMMON (or ground) and OUTPUT. Ideally there should be a couple of capacitors included in the circuit to decouple the regulator from the supply lines but, in practice, you can get away without them. Simply connect the Positive of your supply batteries to the INPUT pin. The Negative of your supply batteries goes to the COMMON pin. The OUTPUT pin of the regulator goes to the Positive connection (red wire) of the mini-USB connector and the Negative (black) connection of the mini-USB goes to the COMMON pin of the regulator. That’s about as simple as it can get!!! The 7805 will get warm (hot?) in use so maybe a small heatsink may be useful. This is all very great info, and thanks, but a lot of trouble for nought. ( last year i built one for myself with the advice of a local electronics store guy) BUT, There are a lot of cool solutions out there that are really cheap. I found (here in Greece) a company called Plaisio rebrands a lot of electronics under their own name brand. Anyway, they sell a multi-tip charger that connects to a solar charger the size of my palm, or charges off the usb port of a computer or car. My build was fun to make but the real thing is just too convenient to pass up! Nicky – yeah, there are commercial alternatives for sure, but this is just for fun. I’m thinking of using AA batteries which will make 6v. Ive read comments suggesting the use of 1 or 2 1n4001 diodes which would make it 5.3 or 4.6v. But USBs are meant to work between 4.75 to 5.25 v.
Anyone thinking of putting a 1n4001 and a Schottky diode in series? Total voltage drop would be approximately 0.85v to 1.15v. Thus the output voltage of the battery pack would approx. be between 4.85-5.15 volts. Which is within the 4.75-5.25 range. I’ll not be around for 2 weeks. I’ll come back and check if there’s any reply in the future. Got a small curve ball when I opened my USB cable. These wires are diff. colors. Red, blue, yellow and brown wires. Does brown = black in this case? Steve – that’s a weird color configuration, but most likely blue is the same as black (ground). I wired red to red & black to brown and nada –the mini usb cable did get hot so I unplugged the battery pack. I’ll have to buy another cheap USB transfer cable and try again. I just learned that there is no wire color standard. You have to go by a USB plug diagram. 1) while you are a brilliant engineer making adaptors for your phone, you most likeLy voided the warranty on your phone using jury rigged adaptors that were NOT recommened for your phone..
2) on some phones the black wire might be positive and the red wire might be negative? 3) check your phone to see if it gets warm or hot, using your battery back: if it gets warm or hot: STOP USING IT!!!! YOU WILL BURN UP YOUR PHONE!!!!!!!!!!!! 1) Thank you! 😉 And, yes, I realize that messing with a phone like this could void the warranty – it doesn’t matter with this particular one because the warranty expired a while ago. 2) You mean in the cable? Well, yeah, but it’s not likely. And even if you did mix them up, most gadgets have protection diodes in their circuitry that prevent accidental reversing of polarities. I have a question, can i use this to power a USB device? or is this only for charging purposes? eg. if I have to run a USB device for about 4 hours would this work? or will burn out the device? Abu – yes, you can use it to power a device too. Four hours should be OK, but it depends on how much power the device is drawing. Thanks Greg.. as usual you are very helpful! Hi Guys, Actually I tried to Modified a 4 AA Battery Charger into a USB Hub Out. So any Device, USB Cable and Any Phone Model can fit in, Including Nokia, Samsung, iPhone, LG Phones. 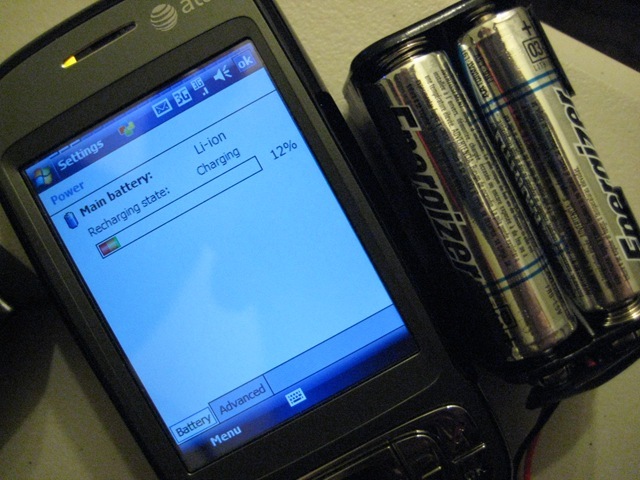 Suggest Using Rechargable Batteries as their Battery Voltage is not 1.5V Per Battery is 1.2V instead. So total of 4 x 1.2 = 4.8 Volt, which is within the 5V Normal Mobile Phone Charger Output Voltage. I hope this helps 🙂 Keep me updated if you guys invented anything New :). I think I know where the efficiency drop is coming from. On the picture, you had a VERY large glob of solder, or so it would seem, connecting the black wire to black wire and the same for the red to red. You should only use as much solder is needed to solidify the connection. Too much solder will decrease efficiency. This is awesome and I’m going to make one just for fun even though they sell them already.You can just buy an extra phone battery and carry that around instead. But al in all a great idea. Hey, can anyone tell me why i cant get this working on my blackberry device. It works on my mp3 though. Was it because i didn’t use enough battery? I need to keep a cell phone charged and close in my house because I am a parent. I have some 12v 7AH SLA batteries I got cheap at a refurbished auto battery supply ($5 each) and simply put a 12v plug with slide connectors on one. I use the phone charger for a car. If the power goes out due to a storm or utilities services, I can keep a charged phone within range to hear it ring and bring it to any room.